There you are, innocently travelling through your usual (busy) day following multiple trajectories, and then: *tumble*, you find yourself falling over something that you weren’t expecting and: Aha! Struck by a new brainwave. Multipreneurs have a tendency to unexpectedly trip over inspiration. This happened to me recently as I was moodling on Facebook. I was inspired in an unlikely way by a YouTube video excerpt from a George Stroumboulopoulos interview with Arlene Dickinson of Dragons Den fame. This was a startling source of inspiration. Not that I have anything against Strombo, or think him uninspirational. To be honest, I’m kind of a fan. If you don’t know him, he’s a Canadian talk show host who interviews celebrities, thought leaders, and newsmakers. He’s also a great Twitter follow. “Yes!” I thought. “Yessy, yes, yes!” (This is in fact how I think). In the same way that seemingly random metaphors and images flirt and whisper to poets who craft them into imaginative compositions of thought and feeling that ultimately express meaning, entrepreneurs take ideas and make products, services, jobs and money. Multipreneurs do this, perhaps more extravagantly, by relentlessly exploring new ideas and conducting an entire symphony of revenue streams simultaneously. Laying claim to our status though, that’s the tricky part. When someone says “I’m an entrepreneur”, the reaction is much the same as when someone says “I’m a poet”. Watch the eyes roll and the eyebrows rise. Around the same time as I was having my YouTube epiphany, this came across my Facebook feed. (Yes, I do spend entirely too much time on Facebook). 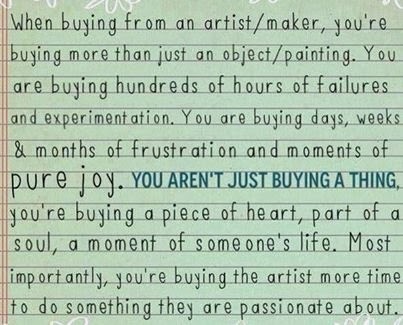 As I read this, I thought, “Well, just take out the word artist and insert the word entrepreneur”. Better still, insert the words ‘economic poet’. The same is true of multipreneurship. It’s a way of life. We are in it one hundred per cent. Heart, soul, mind. Filling the basket. How does the notion of being an economic poet strike you? What about multipreneurship as a way of life, rather than a definition of profession? PS. If you haven’t read Mary Oliver, you must. Click here to link to one of my favourites of hers. It speaks to my multipreneur’s heart.